Alana Bloomfield's "Global Trotting" Wins Young Artist Competition! 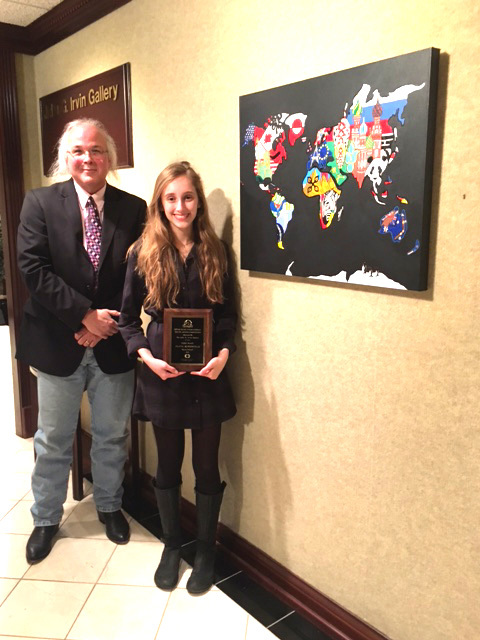 The Lexington Sister Cities 29th Annual Young Artist Competition selected Sayre sophomore Alana Bloomfield’s “Global Trotting” piece as the 2017 winner! The contest, open to students ages 13-18, is sponsored by the John Irvin Central Bank Galleries and the Lexington Sister Cities Commission. Sayre Upper School Art teacher Bill Berryman sent information regarding the contest to his students. “Alana chose to participate in the contest on her own,” said Mr. Berryman. “This is the second time a Sayre student entered the contest and both won first place! I generally have three types of students. Those that need the credits, those that have an interest in art and a few that are artists. Alana is an artist. It is who she is. She interprets the world with a gentle and creative spirit. She is open to instruction and strives to improve daily in her skills." Alana was one of 53 entries from six different schools including Bryan Station, Henry Clay, Dunbar, Lafayette and Tates Creek. Alana was presented $250 from Central Bank. Her artwork will be submitted to the worldwide Sister Cities International Competition Conference in Virginia Beach, VA in mid July. Two winners will be selected at the International Competition; one United States piece and one International piece. Each winner will receive a $1,000 cash prize. Ten finalists are then selected to participate in a worldwide traveling exhibit for Sister Cities International. All entries in the local competition will be on display at the John Irvin Gallery at Central Bank until February 24, 2017.